Checking tire wear is one of the most important elements of good car maintenance you can undertake. 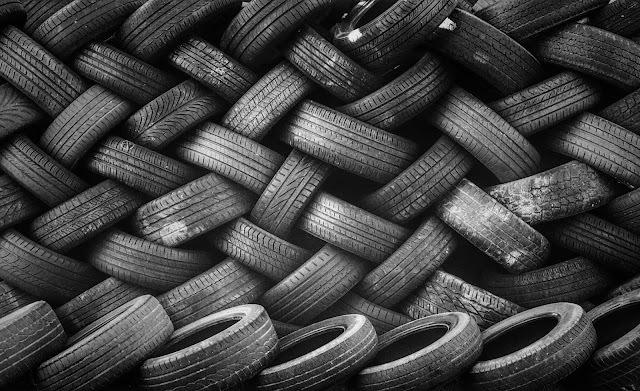 Bald or worn tires can directly cause accidents or make your car unusable. Regular tire check ups with your dealership or mechanic are the best option, but that is not always possible. So here are some DIY tricks to check tire wear and tread safety for those times between service calls. Step 2: Put the penny in between the treads of your tire. Be sure to put the penny in upside down so that the top of Abe Lincoln’s head is going into the treads. 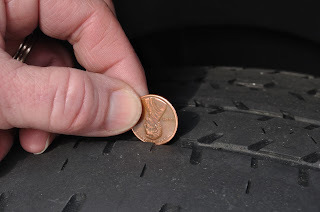 Step 3: Once the penny is in the tire, check to see where the tread comes to on the penny. For example, if the top of his head disappears into the tread, then you may need new tires soon but not immediately. However, if you can see Lincoln’s entire head then it is time to change your tires. Remember to do the Penny Test at different spots on your tire because one part of your tire may pass the test but another part may not. If this is the case, then there may be an issue with the inflation of your tire that could result in damage to your overall vehicle. There are also other ways to check your tire treads including a tread depth gauge, tread indicator bars, and even your own judgement. Often times you can look at the tire and see that the treads are flat or you can feel something wrong with the car as you are driving. It is important to make sure you understand tire tread safety when owning a car. Many accidents (including hydroplaning and losing control of your car in wet climates) can be avoided simply by maintaining proper tire safety.